Situated amid the Štiavnické vrchy Mountains, Štiavnické Bane is spread like an amphitheatre along both sides of the road from Banská Štiavnica to Levice. Today´s municipality was formed in the latter half of the 20th century through consolidation of the independent mining settlements of Piarg (made up of Siglisberg and Vindšachta) and Horná Roveň. Sigelsberg (Siglisberg) is mentioned as early as the mid 14th century as a possession of the town Banská Štiavnica when it was forcibly occupied by the castellan of Šášov Castle. The origin of Vindšachta probably dates back to the 16th century. The municipalities were consolidated under the common name Piarg. The decay of mining in the beginning of the 17th century was averted thanks to several revolutionary inventions. The first one was connected with the use of gunpowder for the purposes of ore separation in the Horný Bíber mine shaft in 1627. Another development involved the removal of water flooding the lower mine horizons. 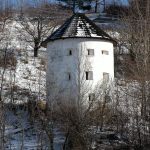 Previous methods had proven insufficient for pumping water out of mines, but a modern pumping technique based on the use of water energy was devised by several well-known personalities who lived there in the first half of the 18th century. Matej Kornel Hell (who settled here in about 1693) constructed a water pumping mechanism driven by water. Propulsion of water pumps required a quantity of water therefore at the start of the 18th century he built the Large and Small Vindšachta Lake and later the small Eva’s Lake on the territory of today’s Štiavnické Bane. These lakes provided plenty of water throughout the whole year. His son, Jozef Karol Hell, was a student of scientist, mathematician, cartographer and builder Samuel Mikovíny, the third famous person who worked here during this period. He used water for the propulsion of mechanisms. Hells and Mikovíny created the admirably comprehensive system of water reservoirs, called tajchy, connected by dikes which served for the propulsion of mining mechanisms. This system was built during the second half of the 18th century and represented the apex of contemporary mining techniques. During the 16th century the largest building work involved the construction of fortifications to protect the rich mining fields from potential Ottoman raids. Some modifications were made in the 17th century. Fortifications consisted of solid masonry walls, except for the wooden western and southern sections, which were repeatedly moved in order to follow the changing area of the mining fields. One of the best-preserved parts of the system today is the Renaissance Vnútorná brána (Inner gate), a ground-floor remnant of a pentagonal bastion incorporated into a family house and a strategically situated circular bastion situated above the road to Banská Štiavnica. In 1735 the town saw the founding of the mining school where Samuel Mikoviny taught. The school quickly acquired a reputation for the highest level of expertise in Europe. Situated in the centre of the town, the former building of the Mining Chamber dates back to the first half of the 18th century and is now the seat of the municipal authority. Opposite to it is the former mining survey building, which was purportedly constructed without the use of a single metal component. The maps produced here achieved the highest levels in Europe. A public hospital for miners was established in the town in 1648. It was moved to Banská Štiavnica at the end of the 19th century. The Sisters of Mercy of the St Vincent de Pauli Order settled in other former mining buildings in the second half of the 19th century, founding a crèche and a nursery school. The Sisters worked there until the demise of religious orders in 1951. The monastery complex of the Hieronymite Order from the mid 18th century dominates the settlement. The Baroque Calvary complex at Horná Roveň incorporates some of the most impressive sacral buildings of the site. Many chapels, stone statues, crucifixions and crosses indirectly signal extinct mining shafts. In the 19th century a carvers’ school was established and machine production of wire ropes commenced, the latter leading to the production of the first machine mining tow rope in the world. The historic buildings of the miners’ settlements scattered about the slopes of the town represent two types of house – the one-winged one with an ante-chamber, ‘black’ kitchen, room and chamber, and the two-winged one. Today both types are used for recreational purposes. The importance of the mining history of the village is emphasised by 31 adits in it. The adit Felix is considered the most significant in terms of important visits in the past. The members of the ruling Habsburg family, including Emperor Franz Joseph II, mined here. The significance of Štiavnické Bane was recognised in 1995 when the Government of the Slovak Republic declared it a Town Conservation Reservation, with regard to the entry of Banská Štiavnica and its surroundings in the list of UNESCO World Cultural Heritage.